Do you still believe freemium has not run its course? Let me start by reiterating my past objections about giving Apps away for free in the hope of getting attention now and monetization later. Call it by whatever portmanteau you wish – freemium etc. or use the justification that free is free marketing. It does not matter if customers are not hiring your App for a job they are willing to pay for and you do not take the time and effort to understand customer jobs and position your App for the right job. The App economy tempts us all with billion customers – small percentage of a large number is still a large number. But trying to target billion customers is what SurveyGizmo CEO described as shotgun approach to marketing. And guess what? You are not the only one with the same shotgun – the App ecosystem has made the same shotgun available to everyone. There are many just like you and their App just like yours with the same hope of converting the same 1-2% of users into paying customers. With all these thousands of look alike Apps, the small percentage of large number becomes small fraction of the small percentage of a large number. Which I assure you is a really small number. That is the chances of an App making $4 million a year is 1 in 10,000. And there is no point in trying to do expected value math here because the winner takes it all. And it turns out Free is not even close to free marketing or to be precise marketing is not free even for free Apps. If you want any thing close to decent installs (let alone frequent usage) it takes considerable marketing resources. In this environment, well-heeled companies with big marketing budgets hold sway. Cast aside these fads and start with the business first principles to go from plan to profit. Start with the customers, not your App. The App could be new but the customer needs are not. Whether it is a “bits” product with zero marginal cost or “atoms” product with non-zero marginal cost, customer needs come first. In fact, it is not a product until you have identified a set of customers whose needs you meet and who want to pay you for that value. Make your choice. Successful strategy involves making choices. You cannot treat billion users as customers. Getting 90 percent of customers to take free Hershey’s chocolates with the hope that they will pay more for extras or will upgrade later is not a strategy. Get your fair share of the value created. Charging for the product is still the simplest of all business models. Product and platform innovation do not mean business model innovation like freemium (which should never be called a business model). If your product adds compelling value to customers, charging for it is simply getting your fair share of the value created. You do not have to be ashamed of making a profit. How do you go from plan to profit? I thought the word freemium went the way of singing fish and MySpace and hoped I never have to write yet another article with this portmanteau in the title. Unfortunately wrong ideas and false beliefs don’t die easily. They are not replaced by some profound truth because the believers suddenly achieve self-realization. As Kathryn Schulz wrote in her book, Being Wrong, bad ideas die hard because they can only be replaced by another equally bad idea. Until another such bad idea comes around we are stuck with freemium. This time we are presented with some profound advice on go to market strategy for Enterprise Apps by Scott Irwin from Rembrandt Venture Partners. In his article for GigaOm , Mr. Irwin recommends freemium as the first option for go to market strategy for Enterprise apps before inside sales and before enterprise sales. Those who are already sold on the idea of freemium will see this as further evidence supporting their case. Those who are new to the idea will likely see the popularity of the post as evidence for its veracity. Those like me are not going to be convinced as usual. The problem this time is the flagrant errors in the case Mr. Irwin makes by recommending freemium for enterprise apps. If you stopped reading here, think about it – Enterprises have a budget and have wherewithal to pay. Why shouldn’t you charge for your value-add? Now to the flaws in Mr. Irwin’s argument. Ignoring Customer Needs: There is absolutely no mention of the customer segmentation and their needs. Why are customers hiring the Enterprise 2.0 Apps for? If you do not understand your target segment and their needs you cannot deliver them an effective product. And if there is an urgent your product fulfills why should you not charge for it? These are enterprise customers and they have a budget to pay for these apps that add value. Ignoring Customer-Channel Alignment: Mr.Irwin starts out by making a case with Salesforce.com, a company I admire for its disruption of the enterprise software landscape and its marketing. But it should be noted that they very carefully chose their initial go to market strategy that aligned with how enterprises buy software – building an highly effective enterprise sales team backed by phenomenal marketing. It was not freemium that helped Salesforce.com grow to $3 billion a year company. Sure their product was easy to setup and use but they were not just fighting against customer apathy, they were competing against strong players with significant sales prowess. Do not for a second think freemium would help compete against entrenched players or serve as free marketing. Choosing Irrelevant Examples: If the topic is about go to marketing for Enterprise Apps the examples used should at the very least use such companies. Not Evernote, a consumer based webapp. When it comes to freemium examples, for the past two years, there have been no other examples than Dropbox and Evernote. Such a model of try the free version and upgrade to premium may work in consumer segment (barely, only 3% upgrade to paid version) but the competition is not going to let that happen for enterprise segment. In addition any such popular example also suffers from biases. Choosing Selective Evidence: Mr. Irwin makes a case using SurveyMonkey, specifically goading us to make app fun so users will use it. First, why should making the app fun be mutually exclusive to charging for it? What about many other applications that are fun to use and but not free. If we want to stick with the same application family as SurveyMonkey, we have SurveyGizmo which you know decided against freemium model to target enterprise customers. There are many other examples of applications that are fun to use and not free. By using selective evidence Mr. Irwin not only succumbs to biases but leads his readers down the wrong path. Anything but Charging For Value: Rest of his article is presented as a recipe for freemium. If you did not have your segmentation right, you do not have your product strategy or go to marketing strategy right. Any other revenue model, however innovative it is, is not effective. Yes Atlassian and others adopted pay to charity, pay what you want, pay with WOM etc models. Likely these models were relevant for them because they started with right customer segmentation. But all those do not apply to your business. Why are management gurus, entrepreneurs, startup gurus and now venture capitalists dead set against getting fair share of the value they create for their customers? This post is my interview with CEO of SurveyGizmo, Christian Vanek on their pricing strategy. A few weeks back I wrote about the continuing changes to SurveyGizmo pricing. It turned out they have been A/B testing their pricing for a while and I had slipped through the crack, finding both the offers. Last week I sat down (over phone) with SurveyGizmo CEO, Christian Vanek and their web marketing lead Kipp Chambers for a conversation on their new pricing. Christian happily shared with me the genesis and details of this simplified pricing. The details are sure to add new dimension to the thinking of most startups that see pricing as simple freemium model or do it as tactical afterthought. Their analytical process, understanding of customer mix and their willingness to go against the conventional wisdom are exceptional traits that need to be commended. Pricing is lot more than an eye-candy pricing page! What was their pricing before the change? Take a look at their previous pricing page. Their pricing options and the pricing page design look not much different from numerous other webapps out there. In fact there are wordpress templates available to show this classic three column design with the “suggested version” highlighted. One glaring difference is, while most webapps include their free version as one of the three presented, SurveyGizmo showed their free version as a footnote. Otherwise this is nothing more than a instance of what Hal Varian described as Goldilocks pricing. Gone are the multiple editions and the pricing page eye candy to nudge customers to a specific edition. There is just one edition with all the features including the advanced features that used to be available only in the higher priced versions. Most importantly, they used to limit the number of responses per month and now they eliminated that limit as well. 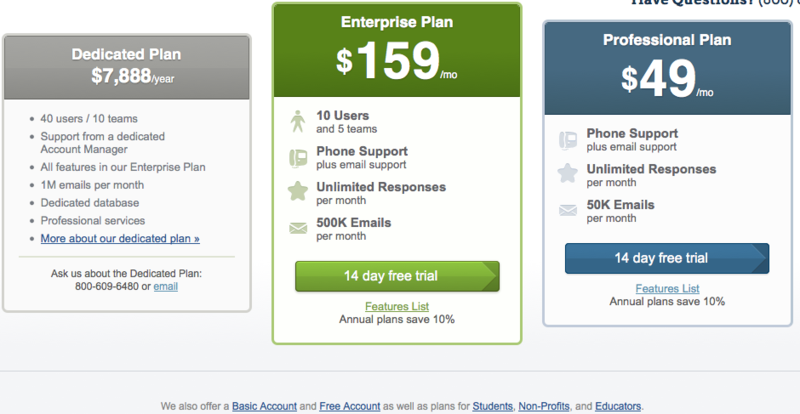 In the past they had a cheaper $19 plan even though it was not prominently featured in the pricing page. Now that is gone along with the $159 Enterprise Plan that was prominently featured and highlighted in the middle of the pricing page. After this pruning, all is left is just one version – no name for it (like the new iPad)- offered at $50 for the first user and a flat fee of $20 per additional user. Another point to note is there is no non-linear pricing built into the price list. Whether it is 100 additional user of 1 additional user, the price is the same, $20 per additional user. To discuss this change, the drivers behind it and how they arrived at it, I talked to SurveyGizmo’s Christian Vanek, their CEO, and Kipp Chambers. Here is what they had to say. Why are you open to sharing this information? Isn’t pricing strategy meant to add to your competitive advantage? “We have a company policy of no secrets”, said Vanek. He stayed true to this policy even when I later asked him about SurveyGizmo’s future product roadmap. “Regarding SurveyGizmo’s pricing there is nothing really to be protective about. As soon as the pricing page went up our competitors likely saw it. Or they will know when your article goes up. Even before this, people were copying the pricing plans and the pricing page down to the name of our plans and their feature set. Once they had comparable plans they were competing on price”. Vanek adds he could either spend all his energy protecting ideas or spend his energy on better execution and coming up with newer ideas. The choice is clear to him. What are the drivers for this major pricing change? We had our $19 plan, the $49 plan and the $159 plan. We found several key things from our analysis of our customers. Very people were opting for the $19 plan. Some of those who chose it for price realized they did not have all the features they needed and were calling us about that. In most cases we ended up enabling the additional features for them. We are not going to tell our customer, ‘you need to pay additional just for that feature’. Some upgraded to higher priced plan just for a brief period to use the advanced features and downgraded right away when their job was done. Those who picked the $159 plan were using only 10% of all possible features they get with it. We were taking lot more money from our customers who were not taking full advantage of what they were paying for. What if a customer wants only one of the feature offered in higher priced version and that is the only one they want? Why should they pay more just for that? We tried for a time some kind of a la carte pricing but it was not the best of experience for our customers. Surprisingly, customer satisfaction was low among those who chose the lowest priced plan and high among those who chose the higher priced plans. You could argue this is because their purchasing decision itself may have something to do with satisfaction rating. Considering all these we thought, there is really only plan that served customer needs and presenting three options is likely aggravating customer choice by adding to their cognitive costs. So we decided to test this hypothesis. This is so different from what every other webapp startup is doing. “I think we are seeing now the end of the freemium model, signing up for free and then trying to up-sell. Our value is in providing both a great product and great service to go with it to customers who need and value our product”. So you are giving up those customers who are willing to pay $20? These customers were never ours to begin with. Customers who want free survey or want to pay $10 or $20 a month have always been SurveyMonkey’s customers. We are okay with that. If a customer is happy with a competitor we are okay with that. These were the customers who anyway ended up getting the features from higher priced plan because we did not want to say to them, that is extra. What about profits lost by eliminating $159 plan? It is acceptable for a pricing geek like myself to say cognitive cost, how is that you are thinking about it? By eliminating the three plans and going to a single plan we have narrowed the field. We are targeting only those customers who want and value the advanced features. *Talking of The Lord of The Rings, Vanek says his super power is he has the voice of Saruman. My favorite survey platform is SurveyGizmo. In the past I have written about its pricing and how it effectively used multiple versions and visual nudges in its pricing page. 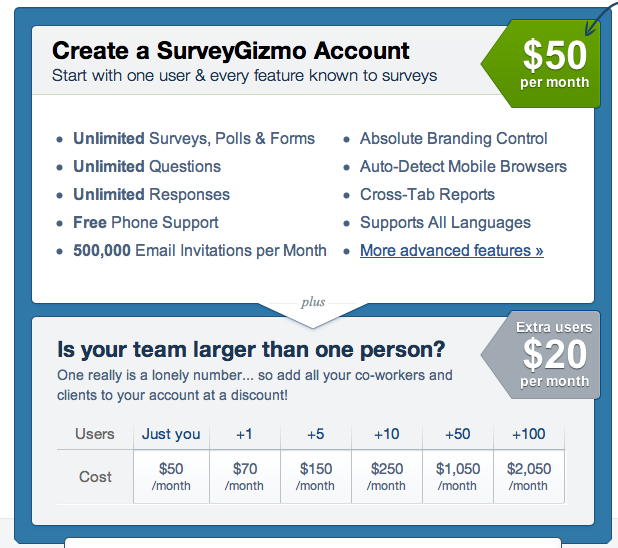 SurveyGizmo has been experimenting with their editions and pricing page since then. From presenting five options, to four options and now there are only three options when you visit their pricing page. What is missing in the three options? What is one version you see in any pricing page you visit but is missing here? The free version. It is not prominently featured in SurveGizmo page. It is still there but as a footnote. It is an indication that their customer mix has changed as they move into next phase of the product adoption. Their current customer mix is more likely made of Enterprise customers with willingness to pay for a survey platform and a budget to match it. The focus has likely shifted from attracting freeloaders who may never convert to those who think differently about the product and have different buying process. What do you see about the prices? The highest priced option is listed first and the middle option is prominently featured (in the middle too). This points more to the size of organizations or groups within organizations they are targeting. While you may notice the two options as different you will later see this difference essentially going away. What do you think about unlimited number of responses in all three? Most webapps differentiate based on number of responses or equivalent – like number of Giga Bytes of storage in case of Dropbox or number of events per months in case of Kissmetrics). SurveyGizmo has done away with number of surveys or number responses as pricing meter. It is a very good approach as most likely customers are not seeing as many responses and it does not make sense as a meter to attach pricing to. Now all these points are for naught when you try to upgrade your free account to a paid account. Despite what the pricing page says they have done away with any feature differences between the different editions. In essence there is just one version of the product with all the features. Well the free edition comes with limitations, otherwise you would be happy with free. Beyond that are no difference in the power of the tool, types of questions, reports, number of emails you can send, etc. If they have done away with differences what is the pricing meter then? They rely on number of users. Want access to all these features? You can get it for $50 and after that it is $20 each additional user on the account. Why have they done away with multiple editions? If one price is good, aren’t two better? When you have multiple versions (editions) these should differ in at least two dimensions. The mandatory dimension is price and you choose the second based on what the customer values and willing to pay the price difference. For example, take MacBook Air. Its multiple versions differ in three choice dimensions. Price, screen size and capacity. Clearly the customers see value difference between 11″ and 13″ screens and are willing to pay for it. But if the customers do not see value difference between versions, they serve no purpose. In fact they add to cognitive cost to customers in making their purchasing decision. When SurveyGizmo had Personal, Professional and Enterprise editions they tried to limit the advanced features like custom scripts to the certain versions. It is likely that only a small percentage cared about these and for the rest the most essential features of the survey platform were more than enough. Hence their decision to get rid of multiple versions/plans/editions and charge only based on number of users. How do you decide on offering multiple versions of your product? Why there is only one version of Apple TV but three versions of Roku? Why are raspberry and strawberry yogurts priced the same? Should your Versioning differ in quantity or benefits? Note: I have used words Plans,Editions and Versions interchangeably in this article. Remember the question I posed some time back on finding probability of a tweet with a link being retweeted? The quiz was a fun way to make the audience realize for themselves the futility of any tips they see on improving retweets. 390 people took the quiz and answered it, (40 because I asked, 350 because Avinash Kaushik asked). Here are the results. Big thanks to SurveyGizmo for its amazing survey platform. The reports pretty much write themselves. You should not even try anything else for running your surveys. For all percentages you see the base is 390 responses. One could say, close to two third are likely to believe and accept whatever is implied by the commentary associated with a partial finding. While 36% asked for more data only a third of them asked for the right data, the percentage of tweets retweeted, that will help them answer. About one in five found the answer (answer is 16%). It is likely that, even in the presence of additional data, four out of five people can be convinced to accept a different answer. For example, when a spurious conclusion is presented in the form of a fancy infographic or presented by someone popular. When you see 5000 people tweeted an infographic that talks about scientific ways to improve retweets, it is hard to stop and do the math. The takeaway is, it is hard for folks to stop and take a critical look at social media findings reported. It is even harder to seek the right additional data and do the math. So most yield to mental shortcuts and answer the easy question. Note that this 16% number is calculated only to show you what is the average. But average hides segments. Likely there are multiple segments here. For some, link or not, everyone of their tweet may be retweeted. The only takeaway is this is a probability calculation and not a recipe and as we collect more data the probability will change. Where does one start- what question does one ask first? What is the relative importance of questions – so one only seeks most relevant data with limited time and resources. The first question is important for marketing strategy and the second is relevant to the notion of value of information. I presented a randomized list of 16 questions to Product Managers, Marketing professionals and Pricing Practitioners – the regular readers of the blog. I asked a lot from them, to spend considerable time to re-order the questions in what they believe to be the right ranking order. This was not a survey, this was meant to be a thought exercise even though I used a powerful survey tool, SurveyGizmo. Ranking questions are the most time consuming and hardest to deal with in a survey. If you are doing a real survey I recommend you do not use more than 5 items to rank. Again, I was not surveying so asking 16 questions to rank is not bad. Did you miss the questions last week? You can gain access now! A complete discussion of the questions, how one goes about answering them and what other key questions that were left out are too big to handle here. Let us ask the smaller problem – What comes first? One should not treat this as you first ask about the product and next ask about customers. A simple ranking estimate hides the bigger insight here. There are indeed the two most common starting points for pricing. If you started with the product your next question will invariably be the one that is tied to the product. Asking questions about the customer is not the default next step for all who chose to start with the product. You cannot be that wrong if you start with either one of these questions. But if you start with the product, when do you come back to worrying about the customer? Hitting the Value Step function – failure to deliver the threshold or delivering way too much. Failure to see the needs and wants of the segment and why they are buying the product, leading to product driven innovation rather than customer driven innovation. A careful and evidence driven marketer may know to avoid these traps. But in a growing market, with weak competition or in the presence of other such externalities one can succeed in the short-term despite falling into the trap. Success only lasts until the next disruption. That is why you see so many brands fall so quickly out of favor. Blockbuster started with the product and stayed with the product. They relied on the idiosyncrasies of the product, like rewind fee (VHS days) and late fees for revenue optimization. Netflix on the other hand started with the customer. They knew that their initial product, DVDs by mail, “was Doomed“. Starting with the customer for pricing enable them to practice revenue optimization that is tied to customer preferences and not the product. Want to know more? Look for more articles in this series.